I was looking for an easy project that I could do with ALL of my kids... those who celebrate Christmas and those who don't. This was WAY harder than you would think! Then I stumbled across this easy peasy idea on Pinterest. I'm kind of loving that it combines math (shapes), fine motor (scissor skills) and art! It was also a great opportunity for me to teach the concept of overlap. 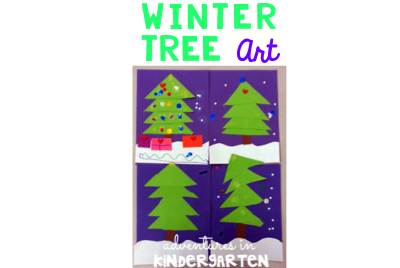 I have a few little ones who do not celebrate, so we simply called it a winter tree. Tomorrow we will add more hole punch circles as snowflakes. Also, I wish I took a close up of the tree on the bottom left... it's a bat tree! I love the things my babies come up with. 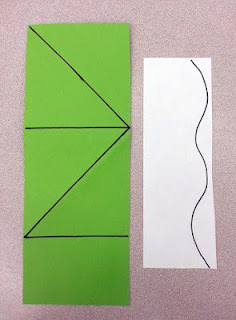 Here is the super easy prep... Cut green construction paper in half lengthwise. Fold the top edge down to make a triangle. Continue until you have four. Draw on top of each line with a marker. Cut a piece of white construction paper in fourths (while holding it horizontally). Draw a squiggly snow line, or let students freehand this themselves. Optional materials: sequins for ornaments, white hole punch circles for snowflakes and small squares and rectangles as gifts. Here are a few more holiday art projects that I can't wait to try! 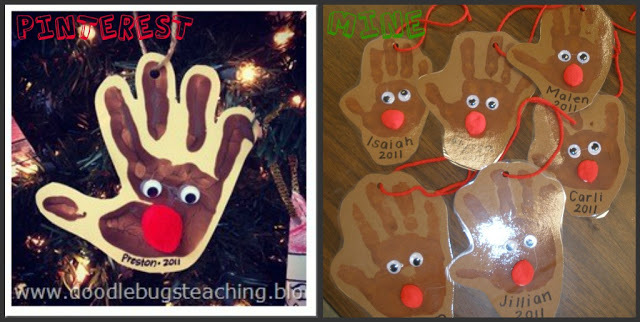 Precious reindeer handprint art. 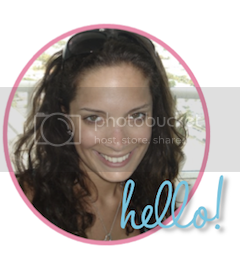 These are both adorable and easy! 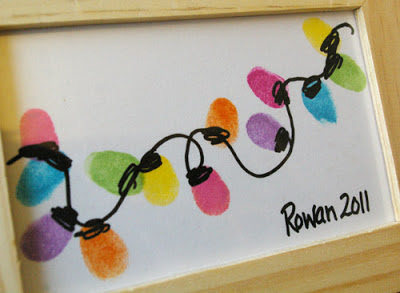 Thumbprint light art is beautiful, and perfect for all of your students, no matter which holiday they celebrate. 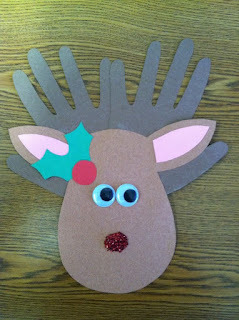 And another super cute reindeer. This one is a bit more involved and would be perfect for a parent volunteer to help out with!